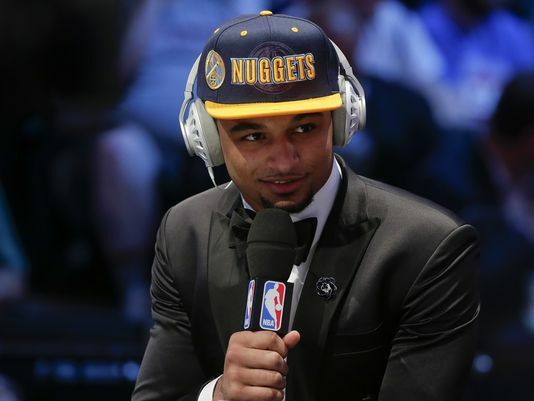 Despite the Nuggets’ shortcomings, Jamal Murray finally played the game that he knew he was capable of playing. The Denver Nuggets lost on Monday night, falling to 2-1 at Las Vegas Summer League, but the emergence Murray made the game against the Heat worth it. The No. 7 pick had his best game of Summer League by far, exploding for 29 points in the 92-81 loss. Although he finished 10-25 from the field, it was good to see Murray in a groove, with his confidence and shot making in full view. It was the kind of game most expected to see from the Kentucky guard from the start. He showed off a bit of court vision, had a chance to showcase his range and demonstrated a bit of gamesmanship, taking it to the Heat’s Damion Lee during the fourth quarter. Not only did he have a spin move that left Lee looking puzzled and headed in the opposite direction, but he hit a shot in his face a few possessions later. And, of course, there was some chirping, too — that Louisville-Kentucky hatred never dies. It wasn’t all great, though. Despite Murray stating that he has been working on his ball handling, and despite the Nuggets’ insistence that he is just as much a point guard as he is a shooting guard, he continues to struggle as the primary ball handler. While Murray drove the Nuggets’ offense on Monday night, he also finished off the game with two crucial turnovers. But if there’s one thing to remember about Summer League, it’s just that: It’s Summer League. These games are supposed to help these young athletes get used to the NBA game and shake off some of the rust from the draft process. The good thing for Murray is that he’s coming off of his best game of Summer League, and he’ll get another crack at impressing the crowd when tournament play begins on Wednesday.